IC Insights has just released its September Update to The McClean Report. This 32-page Updateincludes a detailed look at the pure-play foundry market and an analysis of the historical DRAM price-per-bit trends. Shown below is an excerpt from the Update that examines the IC technology trends in the pure-play foundry market. In 2017, the 7% increase in the total pure-play foundry market is forecast to be almost entirely due to an 18% jump in <40nm feature size device sales (Figure 1). Although expected to represent 60% of total pure-play foundry sales in 2017, the ≥40nm pure-play IC foundry market is forecast to be up only $0.2 billion this year. 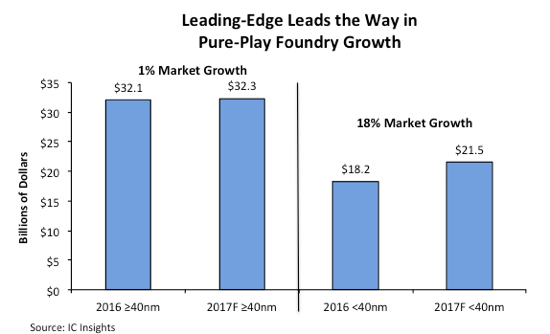 In contrast, the 2017 leading-edge <40nm pure-play foundry market is expected to surge by a hefty $3.3 billion. Moreover, not only is almost all of the pure-play foundry growth forecast to come from leading-edge production in 2017, most of the profits that are expected to be realized in the foundry market also forecast to come from the finer feature sizes as well. TSMC is by far the technology leader among the major pure-play foundries. In 2017, 58% of TSMC’s revenue is expected to come from <40nm processing, more than double percentage at GlobalFoundries and more than triple the share at UMC. In total, TSMC is forecast to hold an 86% share of the total <40nm pure-play foundry market this year. Illustrating how dominant TSMC is in the leading-edge pure-play foundry market, the company is expected to have almost 7x the dollar volume sales at <40nm as compared to GlobalFoundries, UMC, and SMIC combined this year ($18.5 billion for TSMC and $2.7 billion for combined total of GlobalFoundries, UMC, and SMIC). In fact, 10% of TSMC’s total sales this year are forecast to be for its 10nm process technology. In contrast to TSMC, SMIC only entered initial production of its 28nm technology in 4Q15, more than three years after TSMC first put its 28nm process into production. In fact, only 7% of SMIC’s 2017 sales are expected to be from devices having 28nm feature sizes (the company does not offer a finer feature size at this time), which is the primary reason its revenue per wafer is so much less compared to TSMC.